MRMC Celebrates its 50th Anniversary! This year MRMC celebrates its 50th anniversary, and its rate of developing world-class revolutionary products shows no sign of abating. MRMC had its humble beginnings 50 years ago, in 1966, when Australian-born engineer, inventor and part-time racing driver Mark Roberts decided to set up a company to service and upgrade old animation rostrum tables. These were found throughout the TV and film industries at the time, used for everything from cell animation, to film titles and news clips. In the early days, before digital computers, he developed analogue computers to automate the movements of the tables. Eventually, he developed larger and larger tables, then gradually the camera (traditionally just pointing down at the table) was automatically moved, and finally clients requested just moving cameras without a table. Hence started the film motion control industry! In 1977, with the release of Star Wars, the techniques of using motion control for special effects came to the world’s attention, and from then on Mark Roberts Film Services as it was then known created ever better, larger, faster bespoke motion control rigs – including floor and ceiling mounted ones, as well as portable ones. Mark Roberts’ rigs were used on hundreds of films and commercials, but it was the decision to start making “standard” motion control rig models, not just bespoke ones, that catapulted motion control use to a whole new level. It started in 1992 with the Cyclops, the biggest, fastest and most stable studio based rig; it was then followed with the Milo in 1994 – the best portable/location motion control system to this day – for which MRMC won an Academy Award for changing the way Hollywood works. Since then the development has continued with all that you currently see on the MRMC website – from underwater systems to robotics that can move nearly faster than the eye can see, and much more that never gets a mention but is just as extraordinary. In the last newsletter we told you about the success of The Golden Compass with its Oscar winning special effects. As part of creating Iorek the polar bear, Framestore CFC commissioned Ian Menzies from Motion Control Cameras to build a mechanical structure which would move with similar motion to a walking or galloping bear when mounted by a rider. This consisted of a 6-degree of freedom motion base platform and several additional axes of motion, all controlled by Flair motion control software. The motions were programmed and pre-visualized in 3D to relate to the motions of the bear, and transferred to Flair for it to exactly duplicate the motions with the actors, so that their motion would match that of the computer animated bear. Here is some footage from the pre-visualization showing only the mechanical skeleton without the bear flesh, as well as a shot of a test shoot with the Cyclops rig and the motion base in the foreground. Click here to see footage. Welcome to the motion control bargain hunters corner! MRMC have for sale a second user CYCLOPS, second user MILO and a second user GRAPHLITE MARK II by Sorensen Designs. This is a rare opportunity to get a motion control rig at a fraction of the cost of a new system. Second user equipment does not stay around for long so if you are interested contact us right away. The Cyclops is the largest and most sophisticated motion control system available. It gives the greatest range, speed and versatility in a studio based motion control rig with the axes of track, rotate, lift, arm extension, head angle, pan, tilt, roll, zoom, focus and iris with a maximum lens height of 6 metres, almost 20 feet. This Second User Cyclops comes with 16 metres of track. Mark Roberts Motion Control will refurbish the system offering it with a new 12 month warranty. It was good news for The Golden Compass at the Academy Awards when they beat off stiff competition from Pirates of the Caribbean: At World’s End and Transformers to take Hollywood’s highest accolade in best visual effects. Framestore CFC, who were honoured in Hollywood last week, provided key digital VFX from Motion Control Cameras. One of the main effects was Iorek, the huge Polar Bear and his evil arch-enemy Ragnar, and their icy environment. Ian Menzies, of Motion Control Cameras, operated Mark Roberts Motion Controls flair software to control both the mechanical bear and the Cyclops moco system. The life-size bear mechanics allowed the cast to ride and go through the motion of riding a walking or running bear so that it would closely match the CG bear, that was added in post production. With the first RED cameras shipping at the end of 2007, we are now starting to see them being used in conjunction with precision motion control. Dennis Henry, owner of MC2 used a RED camera on his Cyclops motion control rig and had the following to say, “The shoot was a Nip Tuck sponsorship for FX Channel. The shoot involved macro abstract to reveal different medical environments. The moves were pretty fast and shot in real time without any camera shake. Meanwhile The VFX Co. recently also did a shoot with a RED camera on their Milo. The RED camera was supplied courtesy of Ross Media who will be at the Mark Roberts booth at the BSC Show. RED camera on the Milo. Courtesy of the VFX Co.
Is this the biggest motion control rig on the planet? Mark Roberts Motion Control were proud to deliver this month an upgrade to the VFX Co’s Cyclops motion control system to allow it to carry their 9 metre long Carbon Fibre Arm – almost doubling the original arm length on the Cyclops. The Cyclops is the largest motion control rig available from MRMC. The London based VFX Company came to MRMC to request the ability to switch between using the standard arm which gives 6 metres of lens height and their Carbon Fibre arm which comes in 3 sections allowing it to be up to 9 metres long and giving a lens height of about 10 metres (over 30 feet)! This made the Cyclops so tall that we could not attach all 3 sections or lift all the way up without hitting the ceiling. The work required a new sub-arm to be made to allow the new and old arms to attach securely to the Cyclops, as the clients wanted to be able to switch between both types of arm for various stages in the shoot. The work also had to fit in with the VFX Co’s busy work schedule, so there was limited time for the whole sub-arm to be designed, made and tested. The pictures show the Cyclops with its new sub-arm and only two sections of the Carbon Fibre arm. as any further and the factory ceiling would have been hit!!! This year sees the celebration of forty years of innovation from Mark Roberts Motion Control. The history of our company started with Mark Roberts, our founder and chairman, who was born in Western Australia in the early 30’s. After his education in civil engineering he moved to the UK where upon he had several careers including a stint as an engineer for an American based company Oxberry who produced animation stands and optical printers and a storeman at Lotus, during their pioneering days, where as you can see here he even took the wheel himself on several occasions. In May 1966 Mark set up Mark Roberts Film Services. 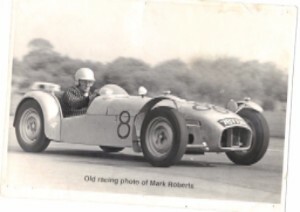 Mark in his racing days. The company ‘Mark Roberts Film Services’ had several contracts with companies in London to service their special effects equipment at night and weekends. Mark spent the rest of his time working on designing and manufacture. In 1972 he produced one of the firstRostrum cameras controlled by an analogue computer and 1975 saw the first digital computer version. Cameramen, including the great Ken Morse, found these systems enabled accurate work to be completed quickly. Ken still works continuously in his Soho studio, still with the Mark Roberts MRC animation stand, nearly thirty years on! With the release of the film ‘Star Wars’ in 1977 there was a demand for motion control in the industry. The company therefore embarked upon the design and manufacture of innovative 3D machines. Having been asked to build a full motion control system to bring freedom of camera movement to the cameraman, to replace the simple up and down and table movement that was only available with the current systems. Mark Roberts Film Services floor mounted, overhead rigs and customised Panther dollies were to set new standards in performance especially in regard to smoothness of motion. Mark inspecting gears and components. In the early 1990’s the company was renamed ‘Mark Roberts Motion Control’ to reflect its current products. Special ‘one-offs’ led to a demand for a standard ‘off the shelf’ system so in 1993 Cyclops our studio based Motion control rig was born and before long customers were requesting a portable system of the same caliber. Enter the Milo in 1994. Not surprisingly Cyclops and Milo have sold extensively in London (the capital of outstanding special effects) and as far afield as Russia, Korea, Australia and Tokyo. There are now over 40 Milos worldwide – the best-selling motion control system. One of the many ‘custom built’ overghead rigs and Cyclops the ultimate in motion control. In 1999 we were enormously proud to be awarded a Scientific and Technical Academy Award for the design of the Milo and the motion control software Flair. The award recognises individuals whose contributions have greatly advanced the technological aspects of film-making.